COLOMBO, Sri Lanka (CNN) -- Sri Lanka's military accused Tamil Tiger rebels Tuesday of killing 17 civilians and wounding 69 others who were fleeing rebel-held territory. The rebels had no immediate response to the accusation. Government troops and Tamil Tigers are locked in a battle over the rebels' remaining strongholds in northern Sri Lanka. Humanitarian groups say as many as 250,000 unprotected civilians are trapped in the area where the fighting is taking place. The rebels have been fighting for an independent homeland for the country's ethnic Tamil minority since 1983. The United Nations Refugee Agency said Tuesday it is accommodating 13,000 displaced people at several sites in the area around Vavuniya, an inland town that is the hub for emergency assistance in the north. The UNHCR said it has received reports of another 5,000 people who will be arriving in Vavuniya over the next two days. "We are outraged by the unnecessary loss of life," said UNHCR spokesman Ron Redmond. "Hundreds of people have died. It must be an extremely horrific situation in there -- a feeling of people being trapped -- so we want to see the civilian population reach safety. That's our main concern." Meanwhile, the Red Cross plans to evacuate 400 sick and wounded civilians from a Sri Lankan beach, a spokeswoman said Tuesday. Most of the patients have been without proper medical care for a week, when fighting between government forces and Tamil rebels forced the closure of a hospital where they were being treated, said Sarasi Wijeratne, a spokeswoman for the International Committee of the Red Cross (ICRC) in Colombo. An ICRC-chartered ferry flying a Red Cross flag left the northern city of Jaffna on Tuesday, bound for the northeastern coastal town of Puttumatalan, where the patients are waiting, Wijeratne said. "At the moment, they're being cared for by staff from the Ministry of Health and they're being supported by the ICRC staff," she said. "These patients will be put on the ferry at Puttumatalan and the ferry will then sail to Trincomalee." Three hundred of the sick and wounded waiting to be evacuated Tuesday were from a hospital in Pudukkudiyiruppu, farther inland from Puttumatalan, that had to be closed last week because of fighting, Wijeratne said. It had been the last functioning medical facility in the area. 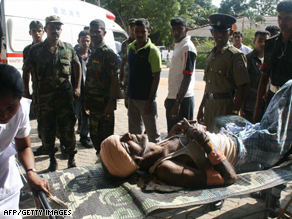 The rest are sick and wounded civilians from the vicinity who came to the beach to receive treatment, Wijeratne said. The rescue is being done with the agreement of all parties to the conflict, she said. The Sri Lankan government said Sunday that more than 10,000 civilians have fled fighting between government forces and Tamil rebels in northern Sri Lanka over the past week, a "sudden increase" in people displaced by the violence. Most of the displaced are from Kilinochchi, while others are from the Jaffna peninsula, according to Sri Lanka's defense ministry. More than half are women and children, it said. The government said it is providing refuge, medical care and sustenance to the displaced civilians. Kilinochchi is the former capital of the Tamil Tiger rebel movement, which is locked in a battle with government troops over its remaining strongholds in northern Sri Lanka. The town was retaken by Sri Lankan forces in early January.